The great British seaside can be a fantastic inspiration for your wedding, and there are endless ways to interpret the theme, for example with food you could go with fish n chips, icecream vans or, if you're feeling flash, oysters! (not forgettting you could always order your own seaside stick of rock with both your names printed through it...). There are also so many props to give your wedding a seaside spin - deckchairs, surf boards, shells, seaweed garlands and vintage metal buckets and spades. The British seaside has such a distinct look and what could be prettier than pastel beach huts and seaside bunting. And although Punch and Judy might not serve as your inspirational couple, they could be your wedding entertainment - for adults and kids alike. If you don't want to go the whole hog and hold your wedding on a beach, but still want to adopt this lovely theme, you could always consider a venue close by. We've got two great (and very different) venues on the site that we would recommend. Portsmouth Guildhall has the most beautiful exterior and as you can see, grand steps leading to its bronzed doors which would make an incredible wedding photograph. It has a variety of rooms, both elegant and spacious, but our favourite is the Zodiac gallery which has the largest acid-stained mural in the world! Located minutes from the sea, you could easily adopt a seaside-flavoured theme. Our second venue, Grand Pier Weston-Super-Mare, is, as you can imagine from its name, right on the sea. They have three wedding packages called Seaside, Coral and Pearl. to suit all budgets. Even more exciting, they offer an evening reception package so that you can watch the sun go down over the sea. What could be more romantic than that! So grab your bikini (Pamela Anderson-style) and go and hitched on the beach! on Thursday, 11 December 2014. 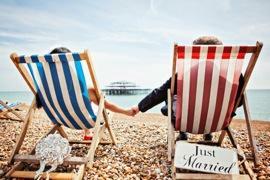 I'm currently planning my own wedding and love this beach idea, there are some nice areas around the UK coast that I've been thinking about, have you any suggestions of anywhere around the Bournemouth area?